AXL, receptor or signal transducer? Written by Jia Liu and Jian Chen on behalf of the co-authors. Viruses replicate themselves by hijacking the life cycle of host cells. In doing so, viruses need to first attach to and enter the host cells. This process is typically mediated by a specific or a series of plasma membrane proteins, known as receptors. The outbreak of Zika virus (ZIKV) in South America in 2015 was found to be associated with microcephaly in newborns. This rendered ZIKV one of the largest concerns for the public health among other infectious diseases, and ignited the enthusiasm of a number of researchers to understand the basic biology behind ZIKV infection. Several early studies suggested that AXL kinase receptor was likely the receptor of ZIKV. This conclusion wasn’t surprising given the important roles of AXL in the infection of other flaviviruses (to which ZIKV belongs) and the facts that the host cells of ZIKV seem to have high AXL expression. Nevertheless, following studies have indicated that the genetic ablation of AXL in certain cell types does not prevent the entry of ZIKV into cells. In addition, some mouse studies ruled out a correlation between high ZIKV viral load and high AXL expression in different organs. These studies rose a puzzling role of AXL during ZIKV infection. In our own research, we were interested in developing therapeutics for ZIKV infection. 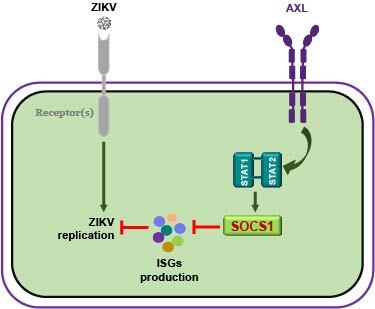 As the primary focus of our institute (Shanghai Institute for Advanced Immunochemical Studies at ShanghaiTech University, Shanghai, China) is antibody development, one straightforward thought was to develop a blocking antibody for ZIKV receptor to disrupt the direct interaction between ZIKV and host cells. With this regard, we went further to understand the biology of AXL during ZIKV infection. We chose to study ZIKV in human astrocytes because the innate immune response of astrocytes are thought to be important during the infection of neurotropic viruses. In addition, there is evidence showing that during peripheral infection, the primary target cells of ZIKV in mouse brains are astrocytes. Blocking such “First Contact” would be certainly an interesting therapeutic route. The first experiment in our study led to nothing surprising but confirmed that knockout of AXL could prevent ZIKV infection in astrocytes. However, subsequent viral entry studies showed that ZIKV could be internalized into AXL knockout astrocytes with a similar efficiency to that in unmodified astrocytes. An even more interesting result came from the analyses of the expression of IFNs and ISGs. We found that compared to unmodified cells, AXL knockout astrocytes exhibited more rapid and more prominent up-regulation of IFNs and ISGs in response to ZIKV infection. All these data together suggest that AXL is unlikely to function as a receptor for ZIKV in astrocytes. Instead, AXL acts as a signaling molecule. In fact, TAM family receptors (Tyro3, AXL and Mer) have been found to negatively regulate type I interferon (IFN) signaling in dendritic cells through an IFN suppressor protein SOCS1. Similarly, we have found in the present study that AXL regulates the expression of SOCS1 in astrocytes through a STAT1/STAT2-dependent manner. Because STAT1/STAT2 transduce the signaling of type I IFN receptor (IFNAR1) during the positive IFN regulation, it is yet unclear to us how STAT1/STAT2 can be involved in AXL-mediated negative IFN regulation. One aggressive hypothesis is that STAT1/STAT2 are phosphorylated differently or act with distinct co-factor proteins during the positive and negative IFN regulations. Nevertheless, the clarification of the role of AXL in human astrocytes puts precautions on our initial therapeutic strategy-developing AXL-blocking antibodies. Obviously, if AXL is not the receptor, AXL-targeting antibodies can not block the entry of virus. Instead, an agonist antibody toward AXL may even activate AXL signaling which, according to our data, can promote ZIKV infection. Our story is no more than one of the thousands of stories happening every day that show how critical basic science is to drug development. Yet, it truly saved us a trip.